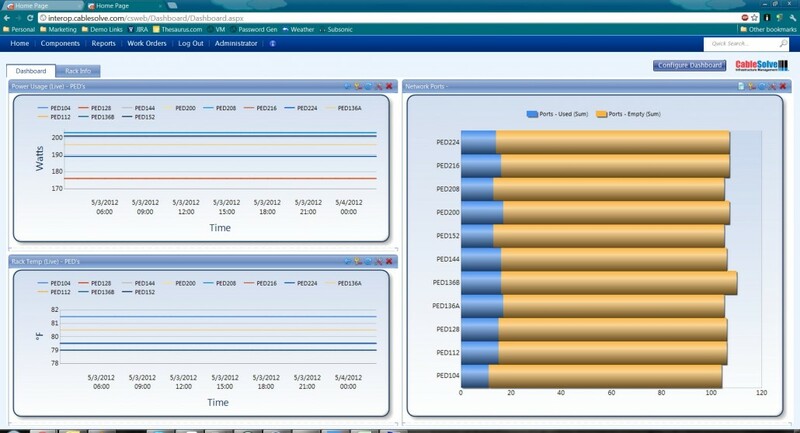 Cormant-CS Web Interface offers complete customisable dashboards, based on the user login. The dashboards can be configured to show historical reports on power, weight, PUE, DCiE or any other numeric informaiton that you have stored. The reports can be displayed as either Line Charts or Pie Chart format. In today’s Data Centre’s, Computer Rooms and Tenancies, it is now more important than every to be able to monitor your power consumption. Whether you own your own space, or you rent part of a co-location, Cormant-CS is able to log and report on power utilisation in almost any organisation. By utilising snmp, Cormant-CS can be configured to poll your devices and literally ask your equipment what power consumption they are currently drawing. Setup Cormant-CS to poll these devices or power rails every 5 minutes, then additionally setup the automatic historical recording of these values, and Cormant-CS will be able to show you in detail the total and individual consumption of your entire Suite, Row, Rack, or device. All of this functionality is build directly in to Cormant-CS, and does not require any additional third party software from PDU vendors, switch manufacturers or other providers. The Cormant-CS web interface can also be setup to automatically update the Football field views. This can be useful to show when a rack has exceeded it’s allocated power allotment. Users are then able to drill down to find out what piece of equipment is drawing the most power at any particular time. Another report that is often used on the Dashboard is to display available switch ports withint your DC. This is useful for future planning and can assist with project management for Server Consolidation, or just day-to-day Rack and Stacking. Save popular dashboards to share with other staff.